“Didya take care of it yet?” asked Len Farbman, my oft congenial but congenitally annoying friend from work. “Perry,” he said firmly, “you only have until July 31! You’re procrastinating again!" 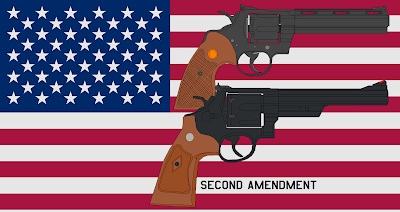 “Look, Per,” counseled Farbman, "Sheila and I weren’t exactly thrilled about having to purchase a couple of handguns either. But now that we both have ‘em, it’s so cool! I said goodbye to Farbman, having promised him I’d go out that very day and purchase my requisite handgun. President Sarah Palin! Swept into office via her rousing “Jesus loves Billionaires” campaign following hot on the heels of the exposure of the Obama/Nancy Pelosi/Shrek three-way love nest, she’d been Chief Executive about a year and a half. The new President had swiftly overseen passage of the Balanced Budget Amendment, which in its first year had mandated closure of all national parks and storage of Old Faithful in a bonded warehouse in New Jersey, the War on Terror reduced to a Hissy Fit Against Terror, and Medicare requiring all participants to seek most forms of treatment from the guy in North Philadelphia I used to get Quaaludes from in the 70’s. 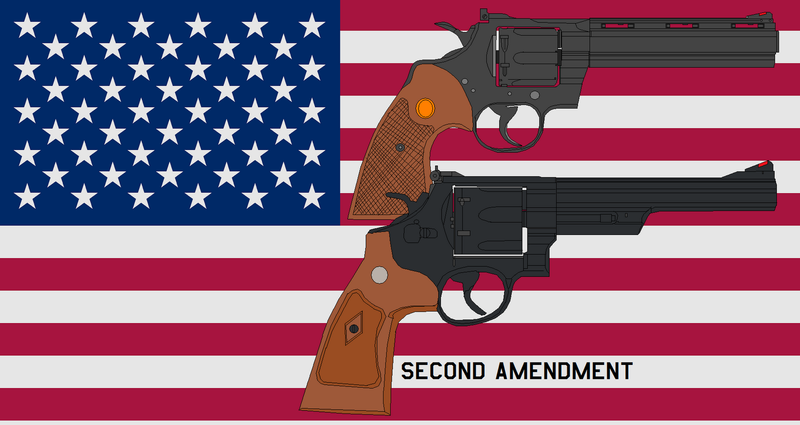 Then there was the “Second” Second Amendment. The Administration had swiftly rewritten its favorite Amendment to the Constitution, removing the awkward language about militias to produce a far more smoothly worded principle of modern governance. Just then, Stephanopoulos said something about Elizabeth Vargas being shot and raced off camera. To get with the President’s program, I headed out to the establishment Farbman had recommended, Friendly Freddie’s’ Fireworks ‘n Firearms. "Not good at all, Friendly Freddie. When I was a kid and I’d shoot off a cap pistol, the smoke would appear half a block away." Friendly Freddie fitted me with what he called a Glock 39. I had to admit there was something fascinating about the shiny precision of the thing --- and unlike on my old cap pistol, there was no picture on the gun barrel of Roy Rogers and Dale Evans smiling and waving "Happy Trails to You!" Funny, I used to think all guns came with that! As I left Friendly Freddie’s, I headed into nearby Woodmere Park. Near the Park’s fountain, a bushy haired young man had pulled a gun on a middle-aged woman who grabbed her derringer and began blasting away. A merry shoot out all 'round the fountain ensued! In a nearby cafe, a male patron was pistol whipping a waiter because his onion soup didn't have enough cheese and there weren't nearly enough crackers. Yep, I'd frequently gotten poor service there myself! Beats undertipping. And I had to laugh when I saw all the alte cockers sittting on the park pavilion with the old-fashioned tommy guns straight out of 1920's Chicago! I wrapped my fingers around my Glock 39 and tingled as I felt its raw power. Don't usually get to tingle all that much. As I strode out into the Park, I understood at last what good old Farbman had been talking about.